We have reached the end of our detective story of exploration into the distant past, and the time has come to take stock. First of all, let us restate the problem that we have solved. The riddle of the pyramids arises out of a discrepancy which many people have found difficult to accept. It is the disparity between the effort of heaping up 25 million tons of quarried limestone and the sole object of burying under them three pharaohs. However much the Egyptians were interested in the afterlife, eight million tons of rock, all nicely shaped and smoothed, per pharaoh must seem excessive. 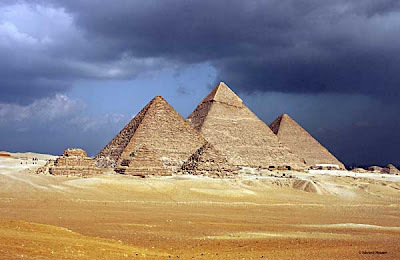 It is therefore not surprising that various alternative uses for the pyramids have been proposed. All of these, however, turn out to be a good deal less acceptable than the straightforward tomb theory. Moreover, we have Herodotus’ statement that the pyramids were tombs, and even if we have doubts whether it was the kings’ bodies or their souls which were buried in them, the funerary function of the pyramids is firmly established. My own solution came as a surprise - at least to me. The object of the whole exercise was not the use to which the final product was to be put but its manufacture. Pharaohs could be buried and were, in fact, buried much more cheaply. What mattered was not the pyramid - it was building the pyramid. There are a number of highly encouraging features in this solution. In the first place it does not contradict the well-established fact that the pyramids were funerary monuments. Secondly, it provides a rational explanation for the colossal labour effort, since employment of labour on an immense scale was the main political and economic object. Thirdly, and this is particularly gratifying, I did not set out to prove my point. My interest was confined to a technological disaster, and the solution of the main problem arrived quite unsolicited. Finally, the solution could be tested on a completely isolated system - the Mexican pyramids - and the test turned out to be successful beyond expectation. Before proposing a new theory, a scientist usually surveys his material critically, searching for weak points or inconsistencies. There may be some, but if so, I have not been able to detect them. On the other hand, the consistent nature of the four points enumerated in the preceding paragraph encourages me to think that my conclusions would have to contain quite a number of errors before the theory could be proved invalid. So let us assume for the present that the solution proposed in this book is correct and let us see where we go from there - apart from future corroborative evidence, with which even the best established theory can always do. It would indeed be a poor and sterile theory unless it opens more questions than it has answered. The first question suggests itself immediately. If man 5,000 years ago looked for a great, unifying common task, why did he choose a pyramid instead of something useful, such as an irrigation scheme? Here the answer is simple. Irrigation projects had been in Egypt long before the pyramids but they were always local efforts, giving benefit to a few villages. Even a more ambitious scheme, such as the Bar Yusuf connecting the Nile with Lake Moeris in the Fayum, would hardly have brought the people together in one locality, and its execution demanded a level of hydrological engineering which, at the beginning of the Fourth Dynasty, was well beyond their ability. The same argument also applies to the more basic and straightforward project of damming up the Nile at the apex of the Delta. It is worth remembering that when the French eventually undertook it at Kaliub in about i860, the dam proved a dismal failure because they had underestimated the seepage of water under its foundations. No, the construction of an impressive man-made mountain was not a matter of choice. It was the only means of doing something spectacular with the large labour force that they wanted to gather, and a mountain of 500 elevation was, as we have seen, the best they could manage. In Chapter 6 we have traced its development through the escalation of Zoser’s monument, which resulted in the Step Pyramid. The building of a distinctive mark in the landscape by making a large heap is still with us in the desire of children making a sand castle. Moreover, this primitive urge is testified to in the Bible (Genesis, XI, 4): ‘Let us build us a city and a tower whose top may reach unto heaven; and let us make a name.’ The Egyptians of the Fourth Dynasty certainly made their name by building the pyramids. The second question is equally obvious. Why was the building of immense pyramids discontinued ? The answer has, to some extent, already been given earlier in this book. Once, through the process of building pyramids the formation of a centralised state had been achieved, there was little point in continuing this activity. Building pyramids in Egypt to bury kings, and in Mexico to sacrifice humans, continued, but these later pyramids were on a scale so much reduced that the primary object of concentrating a large labour force clearly did not apply. In both orbits, pyramid-building had achieved its aim and there was no point in prolonging it. Once the object of creating the centralised state had been attained, independently in the two independent hemispheres, it had found its place in the development of society, and it had not to be invented again. It is interesting to note that the only project of commensurable size, the Great Wall of China, followed the pyramids by 2,000 years and that its purpose was not in building it but in the use of the final product - to save the state from barbarian incursions. Finally, we must ask the question whether pyramid building is likely ever to occur again. We have seen that it was the means by which human society was transformed from a rural village economy to an entirely new form of community life, the state. The world of village and tribe had reached a condition in which no further progress could be made, except through a drastic change, such as took place in Egypt 5,000 years ago. Without this change it would have remained stationary, as it has in many parts of Africa almost to this day. The state as created by the Fourth Dynasty was the nucleus from which, through an infinite variety of expansions, mankind has progressed to its present form. However, the framework, the national (state, has been retained essentially unchanged. The existence of national states soon gave rise to organised wars between them, a pattern that has not been changed in its basic features for five millennia. States have come and gone, nations have risen and fallen, but the pattern of their life and strife has been retained in that uneasy equilibrium which we call ‘the balance of power’. There have been fluctuations, periods in which national wars were almost abolished as, for instance, under the Pax Romana, the Holy Roman Empire of the German nation, and even in the hope of a Pax Britannica. However, all these had to fail because the globe was too large, and from somewhere an enemy would arise to force mankind back into the old pattern of national war. In the lifetime of many of us two of these wars have engulfed the whole world, involving not only the fighting forces but also resulting, in one way or another, in the slaughter of many millions of civilians. Since then, however, two important things have happened. The doomsday machine has been invented and the world has shrunk. The nuclear arsenals have become so extensive that not only can the attacking power win by rapid devastation, but the losing one could, by the judicious addition of long-lived radio-isotopes, arrange for the suicide of vanquished and victor alike. Under these circumstances even the politicians have recognised that mankind can afford only one more world war and that we had better not have it. In fact, we have arrived at the stage where the time-honoured system of asserting the sovereignty of national states by war has ceased to function. With it, one suspects, the justification for the national state as an essential form of human society will also fade away. The world has become much too small for the different shades of men and their individual languages to play separate games. They certainly would find ways of irritating each other. The only thing left to us is the creation of a new pattern of life which takes in all members of the species homo sapiens. In other words, there is no alternative to a very drastic change that is acceptable to everybody. And that means that we have to get together, to work together and to get better acquainted with each other. Together we must build a new pyramid. Unfortunately, it is as yet by no means clear what form and character this new pyramid will have. Its object, on the other hand, is well-defined. It has to be a unifying common task of such magnitude that its impact will be felt throughout the world. Among the various suggestions which have been offered, uplifting the poor and stopping pollution take first place, and they are worthy causes that are in people’s minds. However, while I would consider both as priority programmes, I am not so sure that they are likely to provide what is wanted. A little while ago I accompanied a group of enthusiastic young people to the shores of a huge crater lake in the West African jungle. There are no roads to it, only a track which becomes impassable in the rainy season. Along the shores of the lake live 10,000 people without any medical care in what still is the white, and also the black, man’s grave. The infant mortality is very, very high. Against severe odds the young missionaries are setting up a small hospital at the lake and since its fetish does not permit the presence of metal, they intend to visit the villages by the shore in a glass- fibre boat. My forecast is that, if they are successful, the population will have doubled in five years, with still 10,000 needing medical care and 20,000 needing food. Since the worst pollution on our earth is the uncontrolled proliferation of the human species, the well-meaning enthusiasts will have innocently, but handsomely, contributed to it. I have purposely chosen this rather extreme example to show that most worthwhile common tasks tend to be fraught with difficulties. The trouble with all such programmes is that they are designed to achieve a particular end effect. The great strength and beauty of the pyramid projects lay in the complete uselessness of the final product. Their importance was provided by carrying them out and not by achieving a stated aim. The Egyptian and Mexican pyramids were designed for entirely different uses but the main purpose, that is, engaging a large number of people in a common task, was the same for both. If we want our new pyramid to succeed, we have to make sure that the final edifice is as useless as possible. This will allow for any amount of error and faulty direction in the project since, by definition, a useless final product cannot be made more useless by mistakes. When an article of mine on the pyramids was published in the Neue Ziircher Zeitung I was amused to learn that my colleagues at GERN, the European Nuclear Research Centre, got the idea that it was really less concerned with the pyramids than with them. Their suspicion was, of course, not completely unfounded except that they had taken themselves too seriously by at least three orders of magnitude. The miserable 50 million pounds which they annually spend on trying to find a particle, which is still more fundamental than the fundamental ones, amount, at present standards, to a ridiculously small pyramid. There is only one project in the world today which, as far as one can see, offers the possibility of being large enough and useless enough to qualify eventually for the new pyramid. And that is the exploration of outer space. When for the first time man stepped on to the moon, the whole world sat glued to their television sets, each viewer identifying himself with the astronauts. It stirred their imagination more than any other event in our time. For a moment the pride of human achievement silenced even the clamour for three instead of two Sundays a week and the rallying call for saving from extinction the Puerto Rican parrot. In the end, the results of space exploration are likely to be as ephemeral as the pharaoh accompanying the sun. The effort in money or, what is the same, in labour will be gigantic. No other incentive will be provided than the satisfaction of man to make a name for himself by building a tower that reaches unto planetary space. Five thousand years ago the Egyptians, for an equally vague reason, accepted a monstrous sacrifice of sweat and toil which led man into a new form of society. Perhaps we should build the space pyramid, and the effort in doing so together may be the necessary sacrifice which we must bring to gain a new and peaceful world community.